For the operation of the cRIO modules a software driver is required. 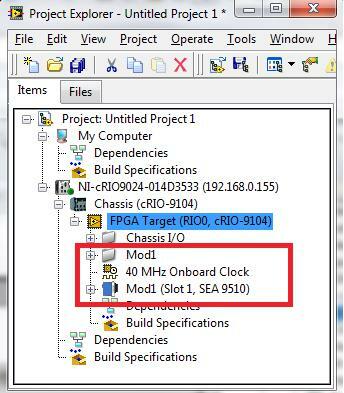 This driver integrates the cRIO module completely in a LabVIEW project and can be downloaded for free from SEA web page. If you look for an interface for CompactRIO, for hitherto no module is available, please contact us. Here you will find cRIO modules for various interfaces and buses. EnDat, SSI and BISS are widely used and commonly accepted industry standards for high-precision determination of rotation angles and distances., The measurement is often acquired with incremental encoders. The encoders generate digital pulses for each angular step and resolution. These pulses are counted for measuring an angle or a length starting of a so-called reference pulse. By analysing the number of pulses, pulse frequency and in the case of several tracks - the phase angle, speed and direction can be determined. S.E.A. offers two different cRIO modules for interfacing of digital rotary, position or length encoders in CompactRIO systems. Each of these modules allows the connection of up to three incremental encoders. In a single chassis multiple cRIO modules can be operated in parallel to increase the number of ports. More information can be found on the relevant product page. LIN (Local Interconnect Network) is a bidirectional single-wire communication bus in automotive technology. LIN is used for communication with intelligent sensors and actuators in a vehicle. The bus topology contains one master and several slaves. The data are transmitted with the so-called. LIN messages (frames). K-Line is a bidirectional single-wire communication bus in automotive technology. It is mainly used for diagnosis of ECUs (e.g. in car services). This bus topology contains one master and several slaves. For data transmission usually KWP protocols (KWP1281 or KWP2000) are used. ARINC represents a set of standardized communication protocols in aviation. The name ARINC refers to the company Aeronautical Radio Incorporated, which was leading in developing the standards of ARINC protocols. One of the well known standards is ARINC 429, which is widely used in aviation. ARINC 429 is a two-wire communication bus, which can be operated in high-or low-speed mode. It also defines the physical / electrical protocol layer.